Seasonal Occurrence: Common spring and fall; greater numbers in fall. Profile by Kayla Ferron: The Yellow Warbler is a small songbird with medium-length tails and a round head. The bill is relatively large for a warbler species. Males are a bright yellow with reddish streaks on its underside. Both males and females have yellow patches on their tail. Their face is unmarked, allowing you to see their large black eyes. 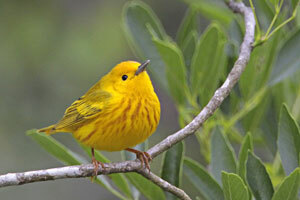 Yellow Warblers will be near the tops of tall shrubs and small trees. Common trees include willows, alders, and cottonwoods. They eat mostly insects and up to two-thirds of their diet may consist of caterpillars. They also feed on mayflies, moths, mosquitoes, beetles, and damselflies. Yellow Warblers will take insects from twigs and hover briefly to take insects from the undersides of leaves. They forage from low levels up to the treetops. Males tend to forage higher and in more open foliage than females. Yellow Warbler males will actively court females for 1-4 days. They breed in shrubby thickets and woods, especially along wetlands. Their nests are places in forks of branches in shrubs and trees. The female builds the nest composed of an open cup of weed stalks, shredded bark, and grass. The males assist the females on trips to the nest. There are usually 4-5 greenish-white eggs in a clutch. The young are fed by both parents and the young leave the nest 9-12 days after hatching. Comments by Don Verser: Yellow Warblers might be confused with Orange-crowned especially in late September when the duller darker northern Yellow Warblers arrive. Look for the yellow undertail (tail spots) on Yellow Warblers as well as the lack of facial markings and "beady-eyed" look. Note that Yellow Warblers are common in September as compared to Orange-crowneds which are very rare.